The analysis included 34 management units located in 21 PAs and 10 Fisheries Agreement areas of the Amazonas state. The study's objective was to understand the current status of the value chain, in terms of finance, access to markets, infrastructure, organization and capacity. Our analysis shows that between 2012 and 2016, fishing production increased by 150% and gross revenue had a cumulative growth of 37%. The pirarucu stock and the number of involved people nearly doubled (reaching more than 4,000 people). In 2016, a total gross revenue of R$ 7 million (USD 1.8 million*) was generated, corresponding to R$ 1.765 (USD 458*) of average gross revenue per person that year. These key and other important data on this fishery management are available in this infographic developed by the project team. The preliminary results of the study were presented and debated at a seminar in Manaus on May 22rd and 23th, 2018. Other studies and projects on the pirarucu’s productive chain were also shared during the roundtable discussions on topics including: Why is the price of pirarucu paid to fishermen is low? Why does the current infrastructure not allow certification and diversification of products? Why are community organization and management essential for the pirarucu management? Click here to read about this event posted in OPAN's website (website in Portuguese). Fourth Seminar of Fisheries and Aquaculture in São Paulo. Photo credit: Cintia Miayj. The technical team concluded the analysis based on the contributions collected during this seminar. The final results were presented at six events. First, the Brazilian Association for Sustainable Fisheries (ABPS) invited CSF-Brazil, OPAN and the Association of Rural Producers of Carauari (ASPROC) to the "Fisheries and Aquaculture Seminar IV: seeking sustainable solutions" in São Paulo on July 24, 2018 - an event about sustainable solutions for fisheries and aquaculture. We presented key data on the current situation of the pirarucu's community management. The next day, also in São Paulo, we presented our results at the "Forum of the Fisheries Chain" organized by the French supermarket chain Carrefour. This chain has proposed to acquire at least 50% of its fish from sustainable sources by 2022, aiming to become the largest distributor of agro-ecological products in the world. Its business strategy is based on the need to transition to sustainable food sourcing offering safe, healthy, and nutritious products , that are socially responsible. Participants of the Carrefour´s event. Photo credit: CSF. The complete study and the specific data of each river basin were presented to the local communities during workshops in Tefé, Carauari and Lábrea, municipalities located on the banks of the Solimões, Juruá and Purus rivers, respectively. In Tefé, the diagnosis was presented at the "XI Meeting of Community Leaders XI", held on July 27, 2018 and organized by the Mamirauá Institute for Sustainable Development (IDSM). Workshop in Tefé-AM. Photo credit: Fernanda Alvarenga. On August 14th and 15th, 2018, our diagnosis was presented to the leaders of the Middle Juruá PAs during the " Juruá Territory Forum XVII" in Carauari -AM, organized by SITAWI (an NGO specialized in financing). Workshop in Carauari-AM. Photo credit: SITAWI Collection. In Lábrea, the workshop took place on September 21, 2018, for leaders of CUs and ILs of the Middle Purus and FUNAI. Workshop in Lábrea-AM. Crédito: Acervo CSF e OPAN. Finally, on October 10, 2018, we held a workshop with key leaders of the management units of each basin and governmental and non-governmental organizations that support the pirarucu management, to discuss the 2018 fishing context and to promote actions to strengthen the pirarucu value chain. Workshop in Manaus-AM about the next steps. Photo credit: Dafne Spolti/OPAN. Click here for more information about our results and project. 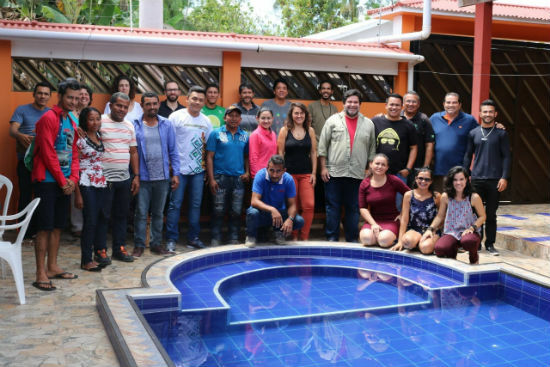 This study was developed with the technical support of a group formed by local community organizations, NGOs and government institutions within the scope of the project "Partnership for Biodiversity Conservation in the Amazon: Sustainable Value Chains". This project is part of the partnership established between the Brazilian Government and US government, via the United States Agency for International Development (USAID), and is executed by the United States Forest Service (USFS), the Chico Mendes Institute for the Biodiversity Conservation (ICMBio) and the National Indigenous Foundation (FUNAI). * Exchange rate in July 2018, R$ 1 = US$ 0.26. Source: www.xe.com.